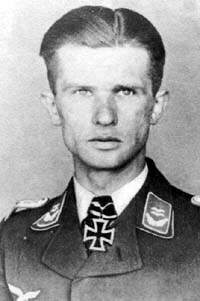 Gerhard “Knall” Koall was born on 7 June 1912 at Königsberg is Ostpreußen. Originally an observer with a Heeresaufklärungsstaffel, Koall underwent conversion training to become a fighter pilot. On 24 January 1941, he was posted to 7./JG 54. During the Balkan campaign, Koall would record his first two victories, including a Yugoslavian Bf 109 fighter shot down over Belgrade on 6 April. Just prior to the commencement of Operation Barbarossa, the invasion of Russia, Koall was transferred to 8./JG 54. By the end of 1941, Koall had accumulated eight victories. On 25 February 1942, Koall was appointed Staffelkapitän of 3./JG 54. The unit was tasked with performing fighter-bomber missions. However, this did not preclude aerial combat and Koall recorded his 10th victory on 13 March, when he shot down a Russian P-40 fighter. On 15 January 1943, he shot down three enemy aircraft to record his 19th through 21st victories. Koall was appointed Staffelkapitän of 4./JG 54 on 17 April 1943. He recorded his 30th victory on 14 August when he shot down a Russian LaGG-3 fighter. On 26 February 1944, Koall was appointed Gruppenkommandeur of IV./JG 54. He led the unit until May 1944. Koall was appointed Gruppenkommandeur of JG 101 on 1 May 1944. On 16 January 1945, he was appointed Gruppenkommandeur of II./EJG 1. Hauptmann Koall was awarded the Ritterkreuz on 10 October for 37 victories and many successful ground attack and fighter-bomber missions. On 23 April 1945, Koall was appointed Gruppenkommandeur of IV./JG 3 based on the Eastern front. On 27 April 1945, Koall was shot down and killed by Russian flak near Anklam while undertaking a ground attack mission. “Knall” Koall was credited with 37 victories. He recorded 35 victories over the Eastern front, including seven Il-2 Sturmoviks.